As I was flipping through my work this morning I came across a series of photographs that caused me to stop and think, “I need to put these on my blog”. Everyone, meet Adrianna and Charlie. They’re getting married very soon and it’s an exciting time in their lives! 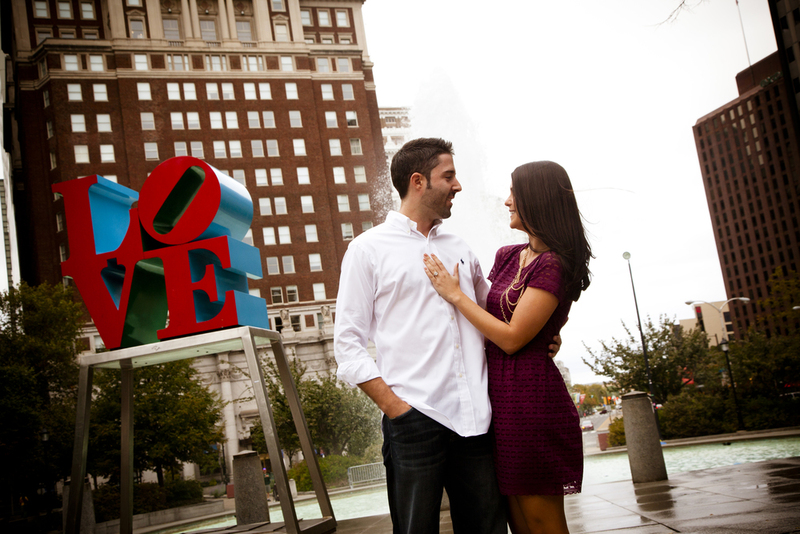 I first met Adrianna and Charlie in front of the Philadelphia Museum of Art for their engagement photo shoot, which was booked as a surprise by their family. As they stepped out of their car to greet me I was dumbfounded with how good looking they were. They could be a featured GQ couple!! Not only are they a gorgeous couple but they’re an exciting and funny couple as well. I barely knew my way around the city, but Adrianna and Charlie came prepared and ready to rock. 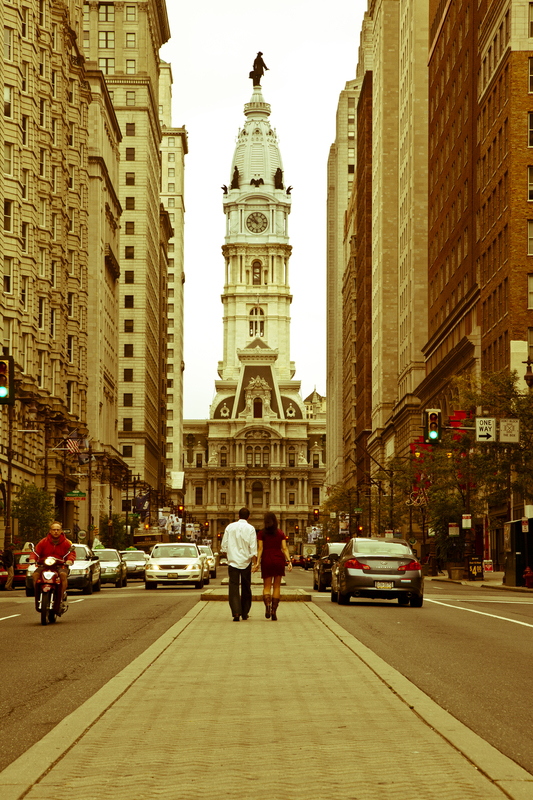 Throughout the session, we went on a whirlwind tour of Philadelphia in Charlie’s car. 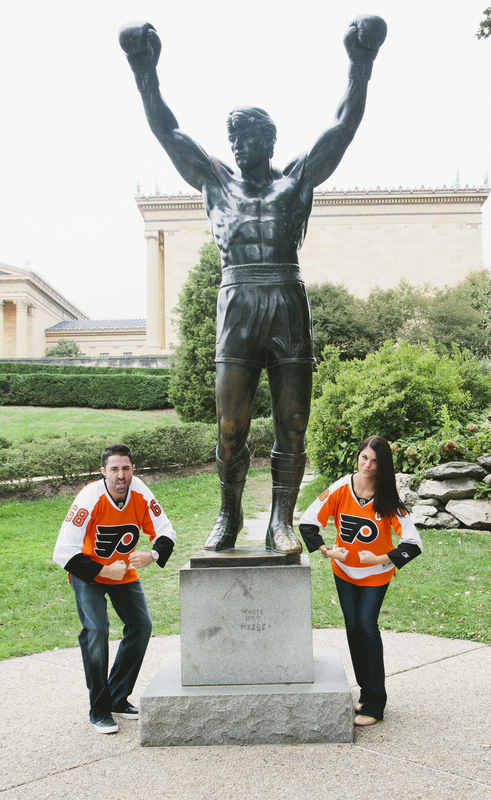 Though I had been to Philadelphia many times before, Charlie and Adrianna were the perfect tour guides. Whenever I visited the city in the past, I had gone to places on a whim, but they knew exactly what places to show me in a short amount of time. A huge plus for this experience was that Adrianna and Charlie wanted to get their photographs taken near the places and spaces I hadn't seen. 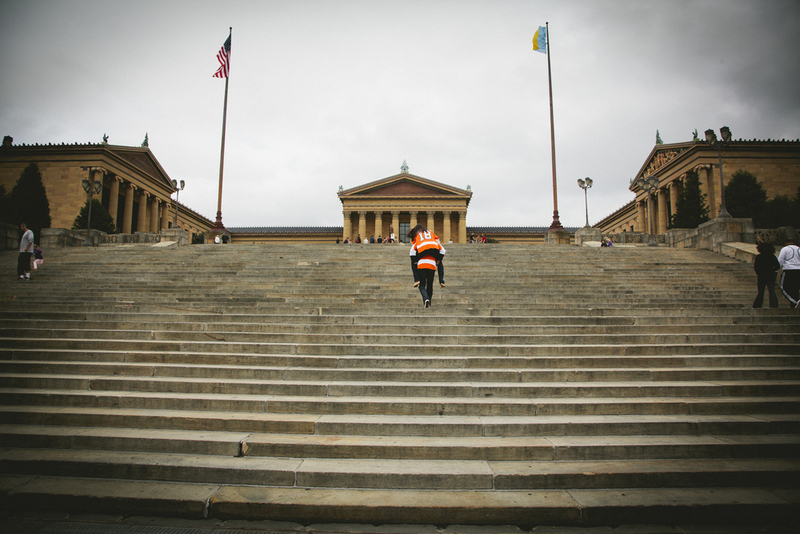 We zipped and zoomed around the roundabout in front of the Philadelphia Museum of Art to find our way into Love Park and in front of the amazing view of city hall. As we stepped out of the car onto the median cars were beeping and people were staring, it was a great adventure! We eventually found ourselves heading to Lucy’s, a local hot spot where the two met and fell in love. We wanted to get some shots inside but it was closed.... Photographic Shots not SHOT SHOTS! Silly readers it was only 9 in the morning! Get your heads out of the gutter. From the moment we arrived, you could see it in their eyes that they absolutely loved this place for the memories they share together there. This was the perfect place for them. As we were photographing outside of Lucy’s a giant crowd of people came out of nowhere and made for a really cute shot of a confused Adrianna. It was adorable! The affection Charlie and Adrianna have for each other is a really great thing to experience. This couple has this silly humorous way of showing each other how much they care and they absolutely love to goof around. I find it quite compelling to see the humility in people, and this couple radiated it. It means they’re humble and don't take themselves too seriously; I love that. The fact that they are so honestly humble shows that they are going to have an amazing life together. I’ve only known them a few months and can already tell! With their wedding only a short while away I wanted them to be reminded of how wonderful they are together and to see the memories they’ve made. Never forget the reason you fell in love with each other. “Happiness is being married to your best friend.” It’s clear that Adrianna and Charlie are the best of friends! I wish you infinite amounts of happy years together! Congratulations and have an amazing wedding day! Special thanks to my editor-in-chief Emily Wood!